1. Jacking Bookwormbethie's "Keeping it Weird on Wednesday" idea, but changing it slightly. Bethie has a terribly great idea of posting a random odd factoid about herself once a week. I think this helps readers to get to know her while giving her something to post about once a week. So far I'm undecided about which day to post, but since I think this is something that isn't essential to a crafting blog, I'll use up a quiet reading day (Friday-Sunday) to do this. 2. Starting my book review blog. I'm reading a lot more nowadays thanks to my library's internet reservation plan. I like to write. Now, I just need to write about the books I read. This will also allow me to catalog books I like a lot, help me to think about a book critically, and prevent me from forgetting a book's plot in three seconds. 3. Guest blog for anyone that offers. I love to guest blog. Being given a topic often helps me to write. 4. Edit more. That means writing a post beforehand, and going back to rewrite. I have not been doing any editing for my blogs and it shows. I do it for Helen's blog and my writing is more polished and funnier. 5. Continue with my love of photography, but try to post my pictures faster so I can use them more quickly in blog posts. Also, improve my inanimate object photos. 6. Possibly create a Twitter account for my craft blog and for my book blog. Watching Helen's success with tweeting for her blog is inspiring. 7. Have one giveaway this year, at least! I really love to see giveaways on other blogs because I feel it helps people find you. It also helps you to see who has been reading but not commenting. 8. Jot down post ideas in one of my numerous text files, so that when I do want to write I'm not left floundering. 9. Bake more. This will not only make me a better and more interesting blogger, but I've found, surprisingly, that I enjoy making desserts. 10. A once a month, at least, roundup of links to articles/posts/finished items that I like. I find so much that I like, but never highlight these things. Last, but not least, have Nathan help me blog. Love the photo! 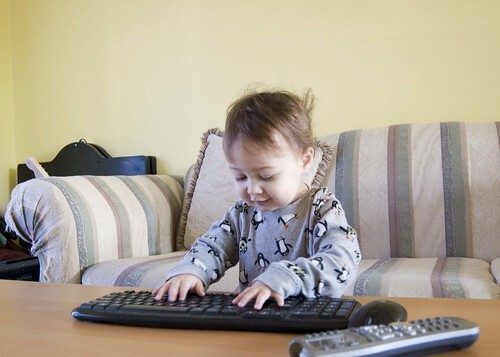 Can't wait for Nathan to write his first post! I can't wait to see your book review blog. I've been a huge slacker about reading lately since I've been so consumed with knitting, but maybe your blog will help push me back into it!